Tenant Alterations: A Clash of Many Interests, The Tenant's Alterations Check List, Enter the Equipment Lessor, The Landlord's Response to the Equipment Lessor, and the Lease Clause Critique: The Pro-Landlord Office Alterations Clause. This LARG looks at alterations by the tenant to its premises, and the clash of interests between the landlord, the tenant, the landlord's lender and the tenant's lender that results. Both retail and office/industrial landlords find themselves leasing more space to noncredit tenants these days, and such tenants frequently borrow from third party lenders to finance improvements and leasehold equipment. This means that alterations clauses get more scrutiny than they used to, since both landlords and tenants often have lenders looking over their shoulders during lease negotiations. The Tenant's Alterations Checklist is a specific laundry list that tenants (and landlords) might wish to consider during negotiations that focus upon alterations issues. Enter the Equipment Lessor analyses a Waiver and Consent Form commonly used by equipment lessors that provide equipment to the tenant which is affixed to the leased premises. In the most usual case, the Waiver and Consent form is used for restaurant equipment, security systems, telephone, telecommunications and computer equipment, but it could apply to any equipment affixed to the leased premises subject to third party financing. The Landlord's Response to the Equipment Lessor outlines basic concerns that the landlord and its lender would likely have regarding the Waiver and Consent, and contains an addendum for such a waiver that neutralizes some of its provisions most objectionable to landlords. The Lease Clause Critique covers a pro-landlord alterations clause for office buildings. The clause discussed there is generally representative of alterations clauses found in landlord-oriented office forms. Does the tenant have the right to make nonstructural alterations to the premises during the term of the lease without first having to obtain the landlord's consent? If so, must the tenant notify the landlord that it is constructing such alterations? Can the tenant modify electrical, plumbing, mechanical (e.g., HVAC), or structural components of the building? If the tenant cannot modify structural elements of the building, is "structural" adequately defined? Does it mean solely load-bearing, or does it include slab penetrations and alteration of exterior nonbearing walls? If the tenant can make nonstructural alterations which do not exceed a certain dollar amount for any given alteration, is that amount increased by the CPI over the term of the lease, or otherwise subject to periodic increases? Is the tenant required to notify the landlord's lender if it wishes to make substantial alterations to the premises? Do substantial improvements by the tenant violate the landlord's deed of trust or mortgage for the building? Should the tenant ask for a warranty from the landlord in the lease that they do not? If a retail tenant can make alterations without the landlord's consent, or if the landlord's consent is necessary and given, does that by itself suspend the retail tenant's operating covenant during the course of the alteration? Who is liable for increased taxes and assessments that relate to alterations? If the tenant is liable for such incremental taxes, how is the amount of such taxes determined, especially if there is no separate assessment for those particular alterations by the taxing authority? Must structural alterations (including slab and exterior wall penetrations) be supervised by the landlord's structural engineer, whether or not the landlord's approval is required for such alterations? 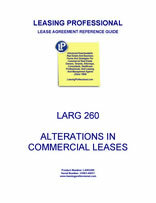 Is equipment financed by third party lenders (e.g., restaurant equipment, alarm systems, telephone and computer equipment, specialty partitions, millwork and specialty carpet) excepted from the scope of the landlord's alterations clause in the lease, so that the tenant will not have difficulties with such vendors over their particular security interests in such equipment? Is the landlord required to furnish a nondisturbance agreement executed by its lender providing that if the lender forecloses on the real estate that it will not disturb the tenant's tenancy if the tenant is not in default? Is a separate equipment agreement between the landlord's lender, the tenant's equipment lender, the landlord and the tenant necessary to clarify the interests of the various parties with respect to lien priorities regarding tenant alterations and leased equipment and the landlord's exercise of remedies in the event of tenant default? Equipment lessors will usually not install business equipment in leased premises unless they receive a waiver of certain rights from the landlord ensuring that they won't lose the equipment if the tenant defaults. The Waiver and Consent that follows is a form used by many equipment lessors that furnish telephone, telecommunications or computer equipment to tenants in office buildings. The purpose of the form is to give the equipment lessor furnishing the equipment fairly broad rights regarding the installation, servicing and removal of that equipment. The form also ensures that the equipment lessor will not face competing claims against the equipment from the landlord under the lease if the tenant defaults and the landlord is in the process of evicting the tenant. It is reasonable for equipment lessors furnishing equipment to tenants to have some sort of arrangement with the landlord regarding these issues. However, the landlord must be mindful of the loan covenants in its lender's financing documents that pertain to the security for the loan, and the landlord's own interests with regard to leasehold improvements and the landlord's remedies in the event of tenant default. Clause #1 of the Waiver and Consent provides that the equipment which is itemized on Exhibit A to the form may be installed or affixed to the real estate, but that it will still constitute personal property, and that title to the equipment will remain in the equipment lessor's name or in the name of its assigns, as the case may be. This provision appears in the form because language in pro-landlord lease forms customarily makes all improvements to the leased premises vest in the landlord's ownership at the time they are made, except for trade fixtures and equipment (see Section 15.1 of The Lease Clause Critique). The equipment lessor includes such language so that it will have no argument with the landlord as to ownership of the itemized equipment.